The more a wearable transmits the data it collects, the shorter the battery life powering the shuttle of information from the device to a computer, cellular or Wi-Fi network. Two scientists at NASA's Jet Propulsion Laboratory (JPL) and the University of California, Los Angeles, have developed a chip intended to make the power needed to send data negligible, enabling the wearable to run longer without recharging. Adrian Tang of NASA's JPL and M.C. Frank Chang at UCLA have developed microchips for wearables that reflect wireless signals instead of using regular transmitters and receivers. In testing, the approach transmits data up to three times faster than regular Wi-Fi. "The idea is if the wearable device only needs to reflect the Wi-Fi signal from a router or cell tower, instead of generate it, the power consumption can go way down [and the battery life can go way up]," said Tang in a prepared statement. The chip design takes advantage of the fact that data is encoded as 1s and 0s, just like data on a computer. When incoming energy is absorbed by the circuit, that's a "0"; when the chip reflects energy, it's a "1." A barrier to this approach is the reflection of signals off of walls, floors, ceilings, furniture and other objects. To differentiate between those signals and the real Wi-Fi signal, the researchers created a wireless silicon chip that continuously senses and suppresses background reflections to allow the Wi-Fi signal to transmit without interference. The technology has been tested at distances of up to 20 feet. Around eight feet, the researchers experienced a data transfer rate of 330 megabits per second, which is about three times faster than standard Wi-Fi. More importantly, the use of the technique reduced power usage to a thousandth of what's required from a regular Wi-Fi link. "You can send a video in a couple of seconds, but you don't consume the energy of the wearable device. 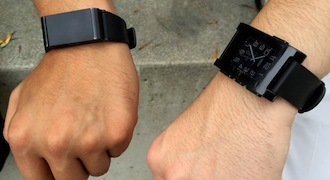 The transmitter externally is expending energy — not the watch or other wearable," Chang said. That doesn't mean power is reduced in the entire set-up. The receiving computer or device being communicated with uses more power, as does the router. Analyzing that problem may well be the next phase of research for the engineers. The scientists said they see multiple uses for the technology. For example, in space astronauts and robotic spacecraft could transmit images or other data at a lower hit to their power supplies and in healthcare wearables could monitor vital signs for longer periods. The patent application for this technology is jointly owned by the California Institute of Technology, which manages JPL for NASA, and UCLA. There are agreements in place already for the commercialization of the technology.